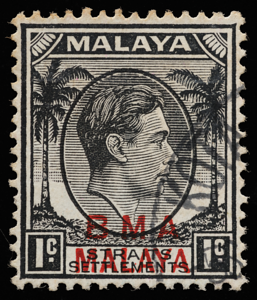 After the war, more than four million stamps in Kuala Lumpur remained untouched by the Japanese. 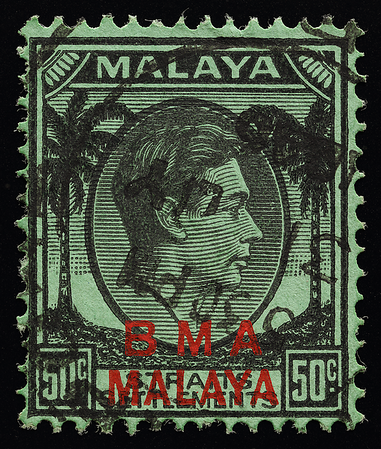 They were overprinted locally with BMA MALAYA under the supervision of Captain H. Holland (Cockburn 1998), who is thought to have experienced teething problems with inks (Pollard 2000a, Cockburn 2016b). The mixing of inks was an 'imprecise art' in those days (Fernbank 2013). Thus were born the mutated shades of magenta and orange (Holley 2016) amidst the radioactive fallout of World War II. The issued form (Cockburn 2016b) of the magenta overprint (centre), flanked by a blood-red overprint on chalky paper (left) and a lighter scarlet on substitute paper with the key plate in a slightly lighter shade than the duty plate (right). 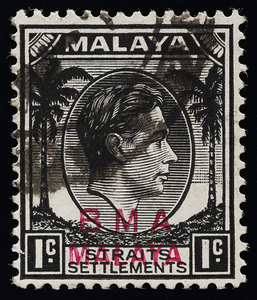 Norris (2016) examined this copy of the magenta overprint and considers it a fine specimen. 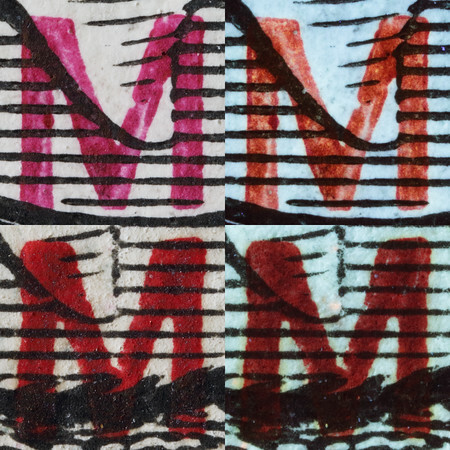 The magenta overprint (upper row) in daylight (left) and 365 nm long-wave ultraviolet radiation (right), showing the 'volcanic lava' fluorescence characteristic of aniline-based inks (Lin 2017a). In the lower row is the red overprint under the same experimental treatment (methodology) showing no signal. Rodgers (2017) subsequently reported similar fluorescence and patchiness of ink in his copy of the magenta overprint. Fluorescence spectrum (download raw data) of the magenta overprint on excitation with a 325 nm helium-cadmium ultraviolet laser (5.16 μW) through a 40× fused silica-calcium fluoride microscope objective. 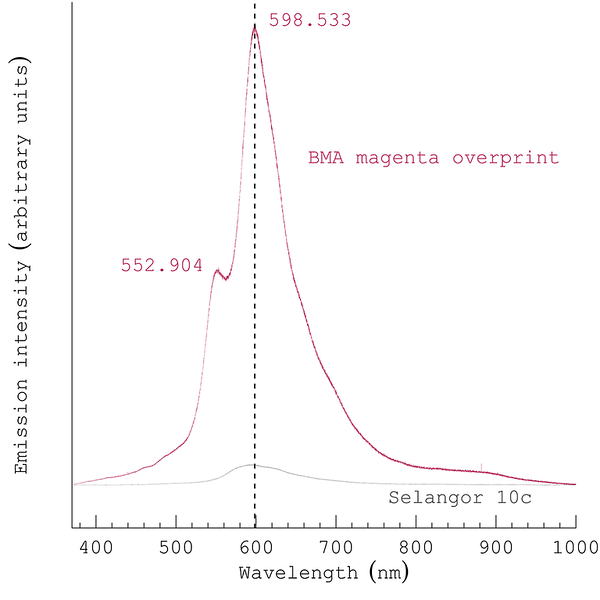 The signal has a main peak coinciding with that of a highly fluorescent shade of the Selangor coconut definitive 10 cents magenta, but the fluorescence of the former is even stronger, perhaps because of higher pigment purity or concentration. 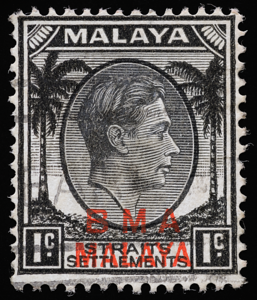 The magenta overprint also has an additional peak absent from the Selangor stamp, indicating the presence of a constituent not found in the latter. Yet another variation on red was the "metallic" overprint reported on some examples of the 50 cents, which the author believes is an intense ink thinly printed. The ink's bright red colour, visually mixed with the underlying black ink showing through, gives the impression of shiny metal. 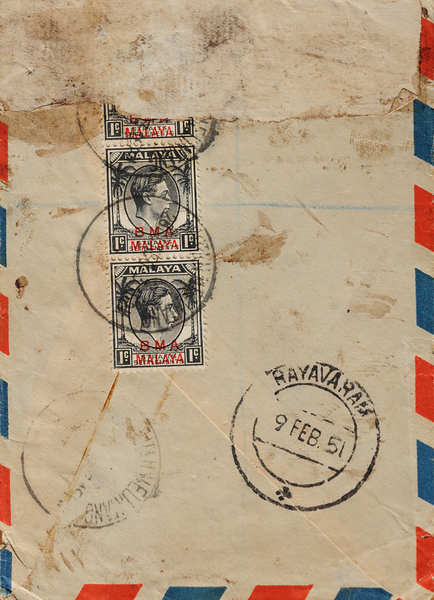 A partially buried strip of 1-cent stamps on the back of a reused envelope.